During the course of family tree research for myself and others I’ve come across ancestors born in England, Scotland and Ireland. There’s a wealth of information that can be found using the internet to find things out. My first port of call for English ancestors is findmypast.com. This site provides a number of important records that can be searched online and is very easy to use. It’s possible to search the Birth, Death and Marriage indexes from 1837 onwards. This gives you the information needed to order birth, marriage and death certificates from the General Register Office. Another important resource from findmypast.com is searchable census records from 1841 through to 1911. These can be searched by name and address. The latter can be useful as Birth and Death certificates often give the actual address of the people involved and this address can be used in the census search if a name search is giving no luck. Passenger lists for people leaving the UK from 1890 to 1960 are also available. This can give clues as to what ship ancestors used to get to New Zealand (or other places) and who they traveled with. Although findmypast.com includes parish records from 1538 onwards I’ve not had much luck searching these. I assume not a lot of the parish records have been transcribed yet. If you’re going to be doing a lot of research I recommend the subscription payment option. Paying ‘per record’ could get expensive and discourages exploring and following leads. The free alternatives don’t have as many records available as the non-free sites but are still very useful - and the search options are often more flexible. I tend to use both the free and findmypast.com sites. For Scottish ancestry searches I use Scotlands People. This site has Birth, Death and Marriage lookups, Census records and Parish records. I have had great success searching this site. It does require payment and there is unfortunately no subscription option. These limits ‘browsing’. You really need to be specific and confident that the record you want to look up is the right one otherwise you’ll end up spending a fair bit of money. An example of a Parish record obtained from Scotlands People is this record for Duncan Campbell, born 1726. Duncan is not an ancestor of mine but was the owner of the ship Bethia, which became the Bounty of ’Mutiny on the Bounty’ fame. For Irish birth, death and marriage records I use the Irish Family History Foundation site. This is similar to Scotlands People in that you are charged per search and lookup. Again, being specific on searches cuts costs down. Looks like a useful service even with those limitations and can save a trip to the library to search through the indexes on microfiche. The Great Ormond Street Hospital for Sick Children has opened its historical records for public viewing. The records cover the Victorian and Edwardian admission records from 1852 through to the end of 1914. The hospital is based in London, England, and provides a fascinating new resource for family history research. The archives can be accessed at http://www.smallandspecial.org/. These records can be drilled down further and in some cases provide case notes and other information. Addresses are also provided which can be useful for tracking down where relatives lived. I mentioned in my previous post that you should always check your sources. Sometimes even the official sources add confusion. The other information I received was that Charles (full name Charles Cornelius Double) and Ellen (Ellen Elizabeth Humphrys) were married in the 4th quarter of 1869, Mile End, England. Ellen’s parents were Oliver Charles Humphrys and Sarah Saulter and she was baptised on 21 Nov 1847, died 21 Oct 1927. This was a huge help to my research. I had absolutely no information on the Double side of the family at that time. And here we learn how even official sources cause confusion. I orded William’s birth certificate. He was born in 1873 in Mile End, London, just before their journey to New Zealand. That birth certificate lists the parents as Charles Double and Ellen Double, formerly Humphreys. So that data seemed to match fine. Next I got Ellen Elizabeth Double’s death certificate. She died in Mt Eden, Auckland, New Zealand of heart failure. Her parents were not listed but there last name was shown as Humphreys and occupation of father as Tailor. Again, all matches, great! Next came Charles Cornelius Double’s death certificate. He died in Auckland from a cerebral haemorage, aged 74. The death certificate lists his parents as being James Double and Mary Double, Grocers. Uh oh, this doesn’t match the information I originally got which had the parents as Cornelius Double and Mary Fletcher. To further compound the issue, his wife is shown as Helen Elizabeth Double. This is close enough to ‘Ellen’ to be a possible error in the way the name is heard. To clear things up I looked up the marriage record for Ellen and Charles. There wasn’t one for an ‘Ellen Humphrys’ but there was a marriage between Charles Cornelius Double and Elizabeth Humphries. Slightly different spelling of the last name but that’s pretty common. Is it normal to use their middle name sometimes though? There is an Ellen Humphries that got married in 1869 (the same year of marriage, different quarter though) but to an different person. I ordered the marriage certificate and it added yet more different data. The dates for the ages on the certificate match up and Charles’ father is shown as ‘Cornelius Double’ which matches the information I received but not the death certificate. Elizabeth has the father listed as ‘James Humphries’ and the marriage was witnessed by ‘James and Sarah Humphries’. The father hear is different to the father I got in my infomrtion originally. So where to from here to try and find out what the real information is? Currently I’m ordering the birth certificates of the other children of Charles and Ellen to see if they have more details. I’ll also look up Ellen’s birth record and order her certificate. That should confirm the parents. I’ll do the same for Charles. Here’s hoping this other data doesn’t add more confusion! Currently I’m working on the theory that the parents on Charles’ death certificate are likely to be wrong - death certificates tend to be a less reliable source of information due to the person providing the information maybe not knowing. I suspect that Ellen is the same person as ‘Elizabeth’ and her father really is James. Interestingly the occupation of her father on her death certificate (Tailor) is the same as on her marriage certificate so that’s promising. The moral of this post is always check your sources. And then, don’t necessarily trust them! Cross check them with other sources. It’s funny where you can run across information about your family. Some of my anscestors are from Pitcairn Island and I have a lot of interest for Pitcairn related information. I run a Pitcarn News website for example. On a Pitcairn related mailing list I saw a post about a document containing stamps and an old Pitcairn postcard. I emailed the author, Mark Butterline, of the document giving them some background on the sender and recipients. The sender was my great grandfather and postmaster of Pitcairn Island, Roy Clark. 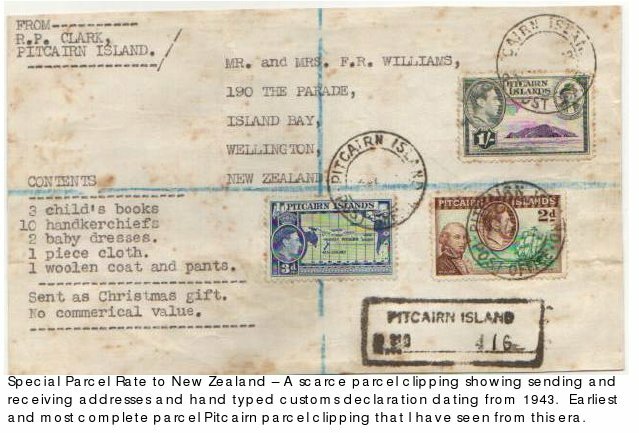 Apparently the parcel clipping was part of a Pitcairn Exhibit by Mark at a major stamp show in Toronto last month. According to Mark the judge was particularly impressed with the parcel clipping and the exhibit won a national gold. The exhibit is also being shown at the 2006 World Philatelic Exhibition in Washington which is on at the moment.